Today’s post is twice the treat! 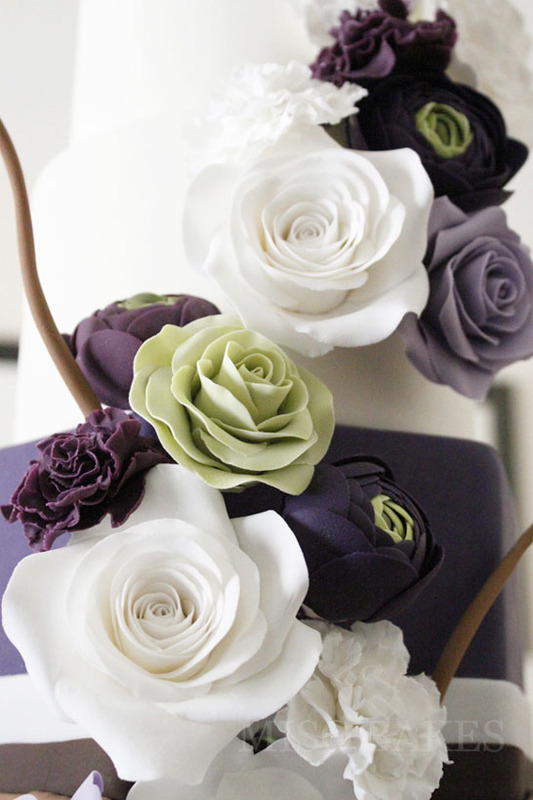 Not only do we have a beautiful new cake design to showcase, but we’re going to learn something new as well! Our contributor, Miso of Miso Bakes, created this incredible cake and is kindly sharing one of her techniques with us. So once we finish swooning over Miso’s lovely design, we’ll learn how to make one of the elegant sugar flowers she used. Frilly and flirty, carnations are not just a filler flower! 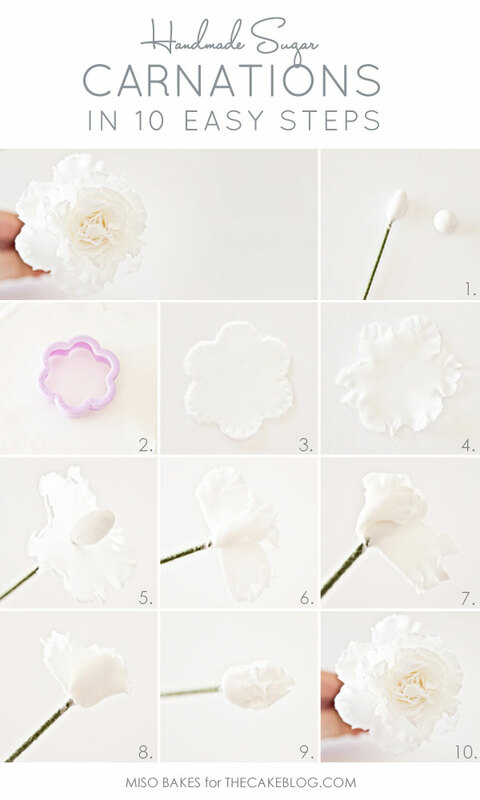 They’re a great place to start if you’re new to making gumpaste flowers. The layers of ruffly petals are more forgiving for beginning hands. Plus, carnations would be perfect for your upcoming Valentine’s Day cakes! I can just envision the pink carnations now! So first, let’s enjoy the beauty of Miso’s Modern Sugar Flower Cake and then we’re on to her Frilly Handmade Carnations. Be still my heart! 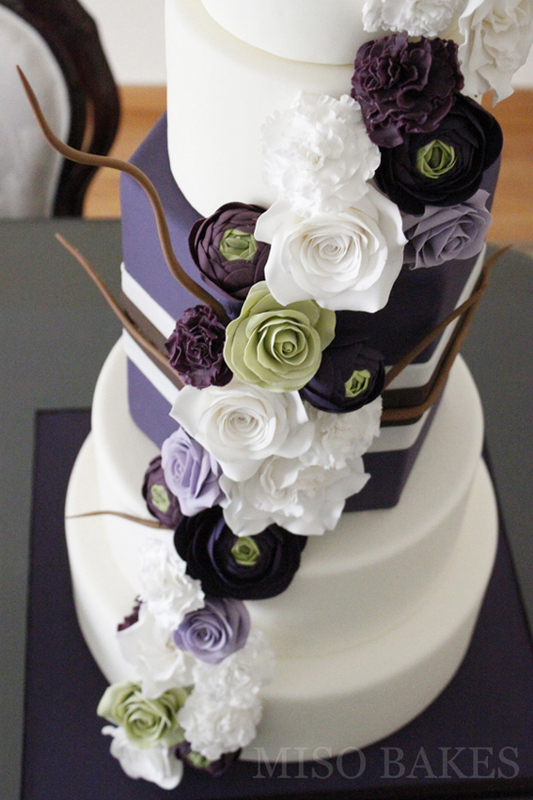 From the striking color combination to the elegant flowers, this design is just stunning! I love the varying shades of purple against the white contrast with just a few pops of green. And now… the promised tutorial. Frilly and flirty, handmade carnations! STEP 1: Create a core using a pea-sized ball of gumpaste. Dry until hard. STEP 2: Cut out a flower or a circle using a flower or round cutter. STEP 3: Using a knife, make slits all around the edge of the flower or round gumpaste. STEP 4: Frill the edges. STEP 5: Slide through the wire all the way to the base of the core. STEP 6: Wet and fold in half. STEP 7: Glue a corner to the center. STEP 8: Repeat on the other side, but this time, folding it the opposite way. STEP 9: What it looks like with the first layer. STEP 10: Repeat with as much layers as desired. You should increase the size of the cutters every 2-3 layers. 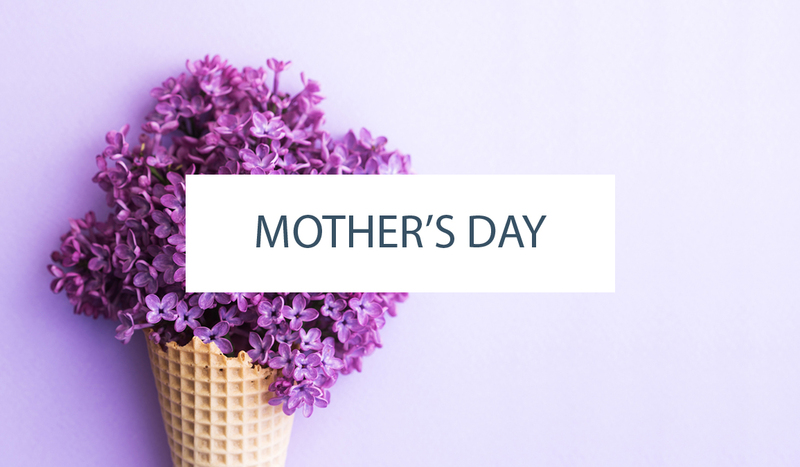 When you get to the last few layers, folding the petals is not needed. Just slide it to the base, wet the petals, and gently mold it to the shape of the flower. This is what a completed carnation looks like! 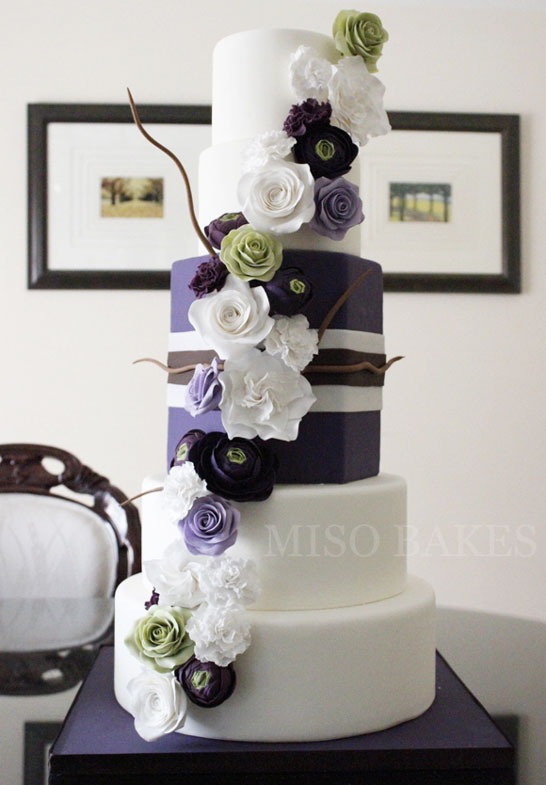 A special thanks to Miso for sharing her exquisite Modern Sugar Flower Cake with us today! And for teaching us all how to create our own Frilly Handmade Carnations! If you give Miso’s carnation tutorial a try, be sure to come back and tell us about it! Happy flower making! Love this. Thankyou. The teachers teach so many diff ways to do carns but not this and seems so much easier. Again thankyou. I LOVE this cake! Very modern and pretty. Thanks for sharing! And for the tutorial too! This is such a striking design with the strong colours & yet still so feminine. Great tutorial. Thanks for sharing. This is gorgeous and what a great tutorial Thank you, Miso! I can’t wait to try ’em out! Thanks for the photo feedback ladies. Everyone’s computer monitor is different, so it’s good to know that you’re unable to see the tutorial. I’ve adjusted the lighting some, so hopefully it will be a little easier for you to see! 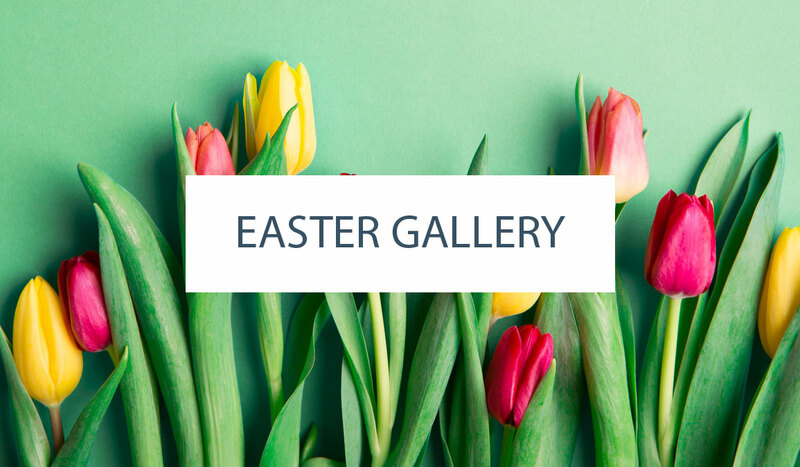 If you’re still having trouble… let me know! Also, you can try to adjust your monitor (pushing your laptop screen back a little might do the trick). I wouldn’t want anyone to miss out on Miso’s gorgeous tutorial!! I can see it! And it looks beautiful!! Can not wait to give this a try!! Awesome tutorial! #3 makes total sense and I just had an ‘Uh Huh! moment. Thank you so much for sharing. 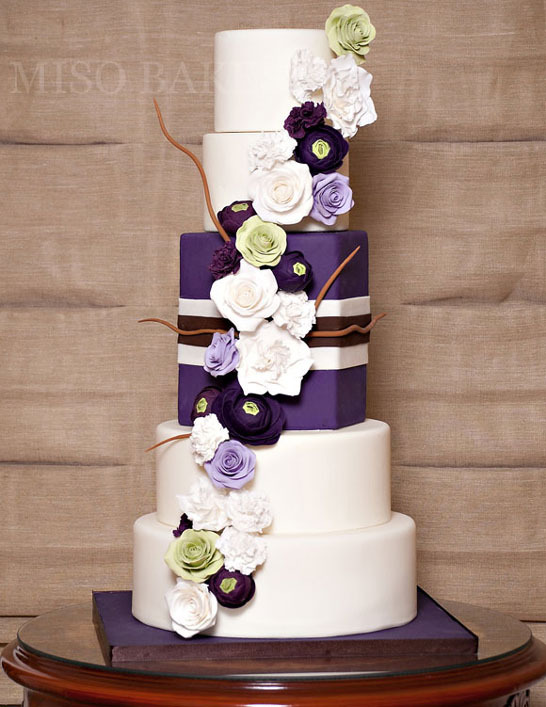 Absolutely stunning cake – LOVE the color palette! Great tutorial, very detailed and informative. Such a beautiful way to replicate this flower. The color palette is gorgeous. What flower cutter did she use? This blows my mind! I have that cutter set too!!! That’s such a beautiful cake! The tutorial is awesome, too. I tried this and have never made anything more than a rose. Turned out beautiful. Thanks so much for the help!! Absolutly beautiful cake! I have a older frined who is getting married and we can’t afford to purchase a cake. So I will try my novice hand at decorating. Please tell me what you use to frill edges? What did you use for wetting and gluing in steps #6/7. Suggestions for gum paste/recipe. Any tips you can give are most appreciated. Wedding the 28th. I will be practicing for the next two weeks. THANKS! May I please ask what software u use to make your picture tutorials ? I have a dumb question : are the flowers themselves made out of gum paste or just the centers? If so what are the flowers made out of? Thanks a lot! Your flowers are beautiful, but I need to give a tutorial on gum paste. I have tried so many ways but have not been successful. Everyone’s recipes show great outcomes but when I follow the same I have not been successful.